More than a decade ago most people believed that hair cloning would become a practical reality by now. This belief was based on research that was done on animal models. Oliver showed that removal of a specific type of cells called dermal papilla cells from the rat hair follicle could induce new hair follicles when implanted in the rat1. Dr. Colin Jahoda took this research one step further and showed that removing these dermal papilla cells and multiplying them in a cell culture before implanting them in the rat, could also induce new hair growth2. This research initiated the interest to develop cell-based treatments for hair loss. Last decade we have seen that two major commercial ventures: Aderans and Intercytex, tried to bring cell therapy forward to the public for hair loss. Unfortunately they both failed in doing this. Their clinical research showed that some hair regrowth was seen in patients, but no new hair follicles were formed. This huge disappointment led to both companies abandoning their work. 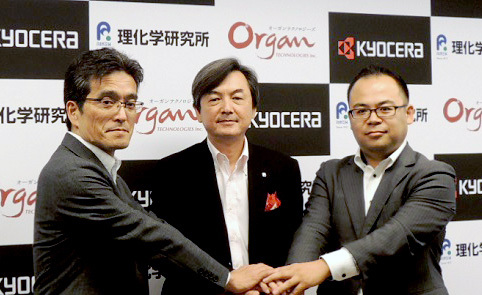 Recently however huge news arrived of a partnership between KYOCERA, RIKEN and Organ Technologies that aims to develop regenerative medicine to treat hair loss. Till date there is still no treatment available that can actually increase the amount of hair follicles we have. This partnership is going to try to tackle that problem, so that one day many types of hair loss might benefit from this endeavor. This partnership in Japan formed, based on the research of Dr. Tsuji, who is the team leader of the laboratory for organ regeneration at the RIKEN Center for Developmental Biology. His research back in 2012 showed that by removal of two types of stem cells from a human hair follicle it was possible to induce a brand new fully functional human hair follicle in a rodent model3. This is particularly exciting when you consider that these two types of stem cells used are the same type of cells that develop our hair follicles in the prenatal period. These two types of cells, the epithelial and mesenchymal cells clump together in the skin in the prenatal period and communicate together to form a hair follicle. This process is known as hair follicle morphogenesis. Many studies have elucidated the central role of the epithelial and mesenchymal cells in this process4,5. It is exactly this process that they are going try to mimic. How are they going to do this? Well first it will require a small specimen sample of the back of the head. The hair follicle will be then dissected to obtain these 2 types of stem cells. After this they will be put in a culture to let both cells multiply. When that is done the cells will be put together in a 3D environment to mimic the skin. Just like in the prenatal period these cells should then communicate with each other to form the very beginning of a hair follicle, a so called “follicular primordium”. A ton of these hair follicular primordiums would then be ready to be delivered into the scalp where they should grow into a fully functional healthy hair. This way even a Norwood 6 or worse should be able to get back to a full head of hair. It is also noteworthy to mention that the hair follicle is also unique as an organ that it can regenerate. In fact is the only one organ known to regenerate repeatedly after birth. To top it all of the hair follicle can regenerate completely when it is cut in half horizontally outside the body and implanted in the scalp again. Both halves of the hair follicle have been shown regenerate and induce hair growth6. Yes that’s right, we can actually already clone hair follicles by cutting a hair follicle in half, although it grows back thinner and the success rate is far from 100%. That particular study actually suggests that the hair follicle has stem cells in both halves as both portion were able to regenerate. That suggestion is actually correct, both halves of the hair follicle have stem cells. Guess why? The cut was done below the hair follicle bulge (epithelial stem cells located there) and above the bulb (mesenchymal stem cells located there). Exactly the two type cells that are going to be used in the treatment of the partnership between KYOCERA, RIKEN and Organ Technologies! It remains to be seen if this treatment will prove to be the solution we all have been waiting for. One thing is for sure it is based on some very solid scientific observations. This is cutting edge regenerative medicine and with such a great partnership it is hard to not get excited about this! Oliver RF. The experimental induction of whisker growth in the hooded rat by implantation of dermal papillae. J Embryol Exp Morphol. 1967 Aug;18(1):43-51. Jahoda CA, Horne KA, Oliver RF. Induction of hair growth by implantation of cultured dermal papilla cells. Nature. 1984 Oct 11-17;311(5986):560-2. Takashi Tsuji, Akio Sato, Akira Takede, et al. Fully functional hair follicle regeneration through the rearrangement of stem cells and their niches. Nat Commun. 2012 Apr 17;3:784. Michael Rendl, Lisa Lewis, Elaine Fuchs. Molecular Dissection of Mesenchymal–Epithelial Interactions in the Hair Follicle. PLoS Biol. 2005 Nov; 3(11): e331. Rachel Sennetta, Michael Rendl. Mesenchymal-epithelial interactions during hair follicle morphogenesis and cycling. Semin Cell Dev Biol. 2012 Oct; 23(8): 917–927. Toscani, Rotolo S, Ceccarelli S, et al. Hair regeneration from transected follicles in duplicative surgery: rate of success and cell populations involved. Dermatol Surg. 2009 Jul;35(7):1119-25.